Scribble Sticky Tote Version & Cabinet Version - Stick It, Write, Reuse! We are very excited about our new "Scribble Sticky" pads that are meant for reusable notes, reminders and organizing. 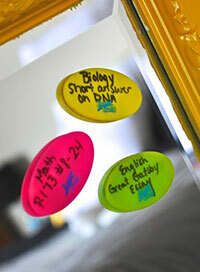 They can be placed on plastic totes, mirrors, windows and in school lockers. 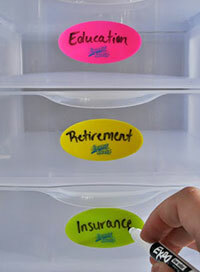 The Scribble Sticky was originally created to be a unique silicone erasable/reusable label for categories on plastic totes for organizing. However, we came to realize that these also served other purposes as short reminders pads that can easily be stuck and simply removed on odd places such as windows, mirrors and lockers. Our Scribble Sticky is very easily moved, with no sticky remnants at all and the writing is quickly wiped off under running water to be ready for your next short note. We have these in a variety of colors to help with organization. 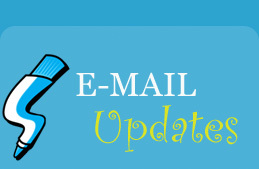 They are really cool new products that I know you will enjoy!